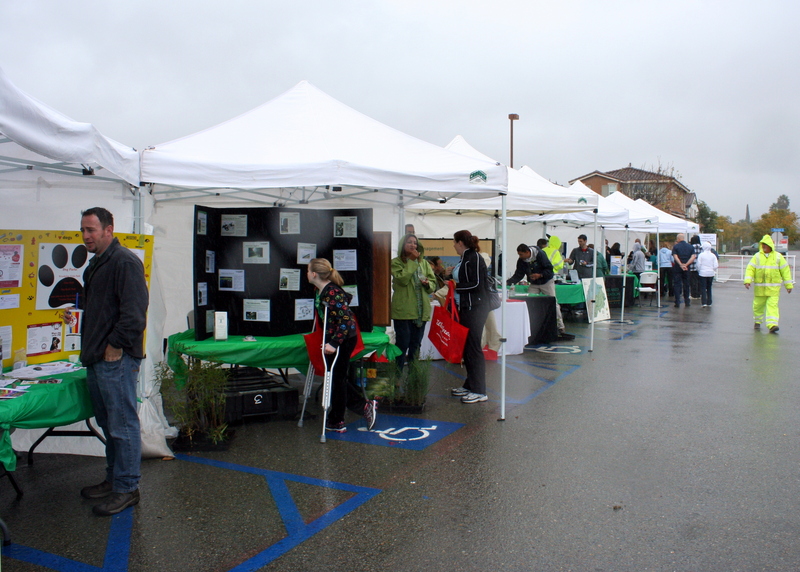 Cold, wind and the threat of rain couldn’t stop over 200 enthusiastic residents from coming out on Saturday, March 17, for the seventh annual SanTree Fest, held this year at Town Center Community Park. Nearly two dozen businesses and community groups manned booths with everything from health and nutrition to environmental awareness. While the weather forced the cancellation of some events and activities, there was still plenty for people to enjoy. SanTree Fest is part Arbor Day, part Earth Day and a tribute to Santee’s continued status as a Tree City USA for the city’s commitment to having a well-planted community. 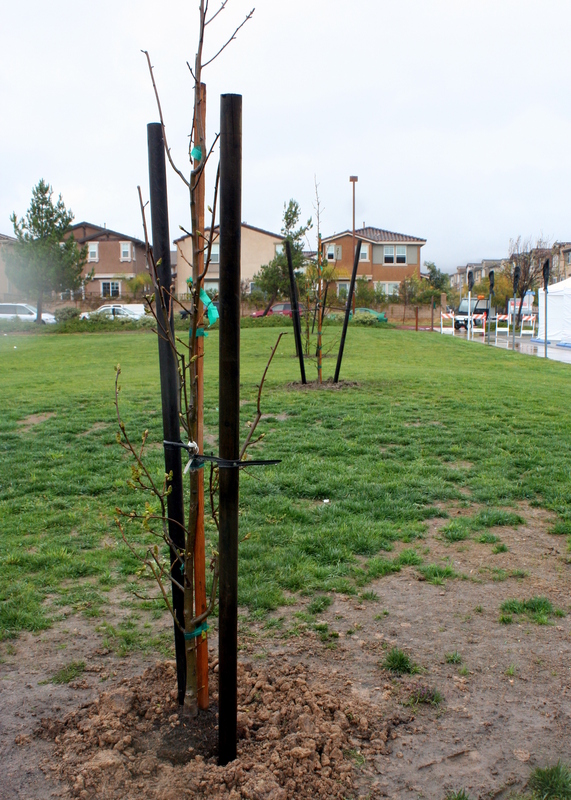 In previous years the celebration has done landscaping at Cajon Park School and done planting and cleanup in Mast Park. This year’s projects included planting 40 trees in the green spaces around the Cameron Family YMCA and the creation of a “rock creek” to enhance the visual appeal of the area. With the looming threat of heavy rain, tree planting was done immediately, with volunteers grabbing shovels and potted trees and heading out to pre-determined locations. In no time at all the trees were in the ground and volunteers were moving on to other activities. Many chose to help lay rocks for the new landscape feature, a sinuous pathway of large river rocks dotted with several small plants. For those willing to get even more “down and dirty,” the Friends of Santee’s River Park and the city of Santee Community Services Department organized a cleanup of the nearby Woodglen Vista Creek which runs through a section of the park. 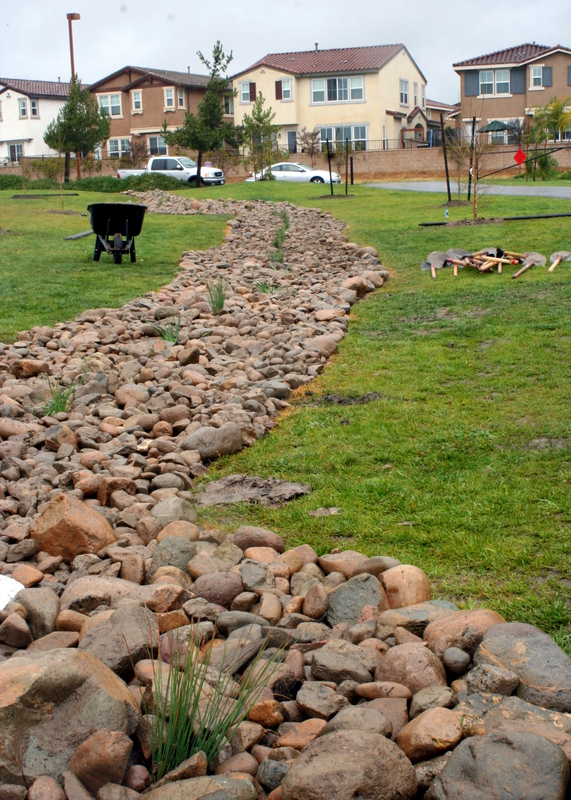 This small tributary to the San Diego River received a much-needed clearing to prevent debris from being washed down into the river and then to the ocean. Among the hundreds of pieces of trash removed were an old tire and a shopping cart. Storm water will now flow more easily with less flooding. Shannon Quigley-Raymond of the Friends of Santee’s River Park was on hand to share the group’s message with visitors to SanTree Fest and to encourage participation in future events. The Friends of Santee’s River Park is a chapter of the larger San Diego River Park Foundation, which is dedicated to preserving and enhancing the county’s namesake waterway. April will feature RiverBlitz – a survey of the San Diego River through Santee to identify problem areas – and an Earth Day clean up at Big Rock Park on the west side of the city. More information about the groups is available on their websites (see links above). Another environmental group on hand was the San Diego Regional Urban Forest Council, an organization made up of a variety of public and private entities. 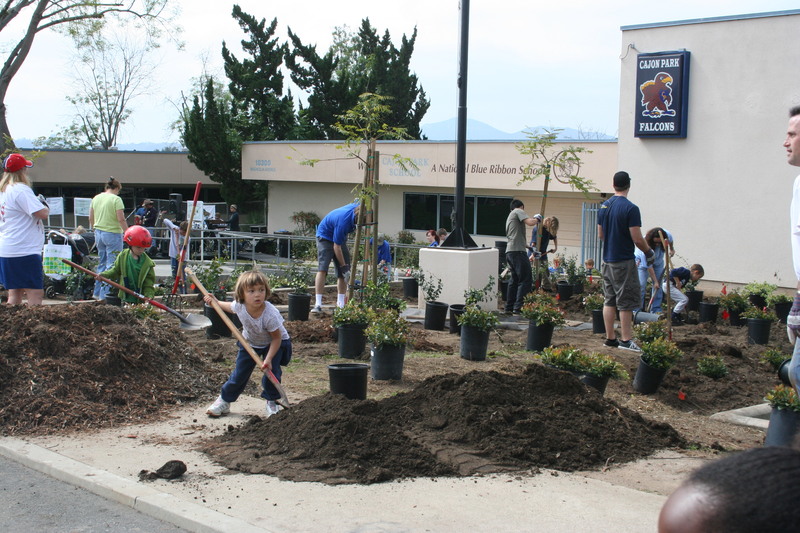 The SDRUFC advocates for a variety of projects such as San Diego County’s Cool Communities Shade Tree Program and provides information about grants and public education initiatives. SDRUFC members Delia Juncal and Mike Palat were there to answer questions and provide information, including a handout on Water-Wise Tree Care for the San Diego Region. For more information about events in Santee, visit the City of Santee website. Last Saturday (March 14) was the fourth annual SanTree Fest celebrating Earth Day and Santee’s sixth straight year being named a Tree City USA by the National Arbor Day Foundation. This year the event was held at Mast Park, which runs along the San Diego River just north of Mission Gorge Road. 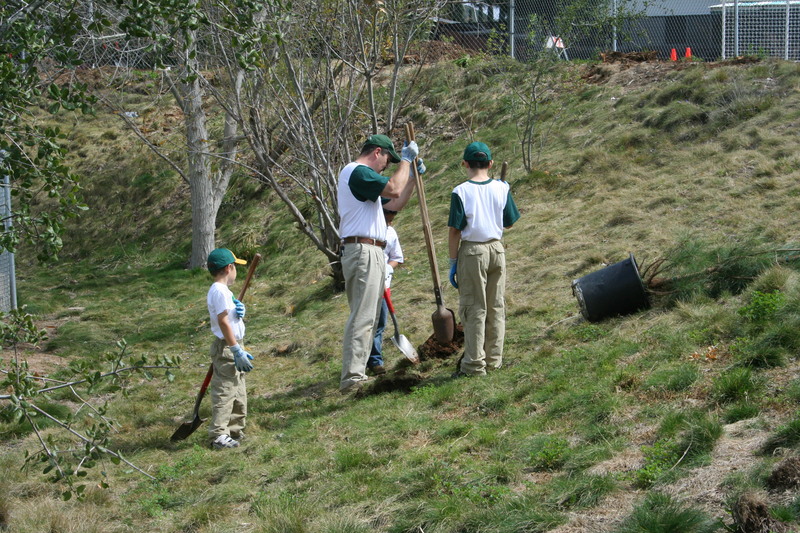 The celebration included tree planting, non-native vegetation removal, and trash clean up. There were also information booths from several local and state organizations and local companies, booths from a number of local restaurants, and music. The 2009 Miss Santee and Miss Santee Teen were on hand, along with several of the runners up (look for a post on them soon). A major partner in the festivities was the San Diego River Park Foundation, which coordinated the vegetation and trash removal activities. The day started out cool, overcast, and a little damp – perfect weather for digging holes to plant trees or cutting down unwanted invasive vegetation. The main clean up work went on at the east end of the park, just north of Wal-Mart. If you have never taken a close look, there is an entrance to a walking trail at the northwest corner of the parking lot, just north of the store entrance. If you wander down the trail you will come to a small bridge over the river. Just beyond that, the Foundation had set up shop for the clean up activities. On the trail I passed several families out with their trash pickers and bags, pulling junk out of the brush along the way. Then at the river several groups were involved in cutting out and removing non-native trees and brush. The goal is to help return the river to as close to a natural state as possible – taking in to account that it runs through the middle of the city. The main activity, tree planting, took place in an open area near the center of the park. Dozens of volunteers were involved, including a large group from Hartford Insurance – easily distinguished by their maroon T-shirts. I’m not sure how many trees were planted, but one section of the park was a mass of people digging, planting, and filling. Meanwhile, others were taking advantage of the information and food booths. There was a great deal of good information available on everything from waste and recycling t0 water pollution and smart planting choices. Organizations as varied as the California Center for Sustainable Energy, the California Department of Forestry and Fire Protection (Cal Fire), and the San Diego River Conservancy. Local restaurants sharing their goodies included Rubio’s, Cafe 67, Hungry Howie’s and Souplantation. Below are some photos of the different booths, along with links to the various websites in case you want more information. The California Center for Sustainable Energy had information about renewable energy sources and their EcoBuild San Diego workshop on April 4 – check their website for more details. California Department of Forestry and Fire Protection had information on the Urban Forestry Program, as well as information from the National Arbor Day Foundation. The San Diego Regional Urban Forest Council (part of the California Urban Forests Council) and the Natural Resources Conservation Services shared a booth with their information on resources, workshops, and events. Sarah Marino (l) and Danielle Hirsch (r) from the local Escondido office of NRCS talked about the brush removal and modification programs and the federal money available for the programs. Another urban tree organization on hand was United Voices for Healthier Communities, also allied with the California Urban Forest Council. Along with the San Diego River Park Foundation, one of its branches – Friends of Santee’s River Park – had information on activities and upcoming events. One of their projects, the RiverBlitz, surveys the river to identify and map problems for later clean ups. The next RiverBlitz will be on April 4 in Mission Valley and April 11 in Santee. The San Diego River Conservancy, a state agency within the Resources Agency of the State of California, was there to present information on its activities in support of the river. Exectutive Officer Michael Nelson (in the green hat) explained about the agency’s work to eliminate 14 acres of invasive plants from along the river near Ward Road. Tom Walters and Connie Wood, Trail Guides at the Mission Trails Regional Park, were on hand to share information about events, activities, and more. County of San Diego Vector Control and San Diego County Libraries were there to share information along with the other groups and organizations. Also on hand were several companies, including event sponsor Waste Management, SDG&E, and West Coast Arborists. Lowe’s sponsored a “Pot a Plant” booth. The City of Santee sponsored a craft booth, with help from the Santana High School cheerleaders. The County Parks and Recreation Department gave people an up-close look at local wildlife. 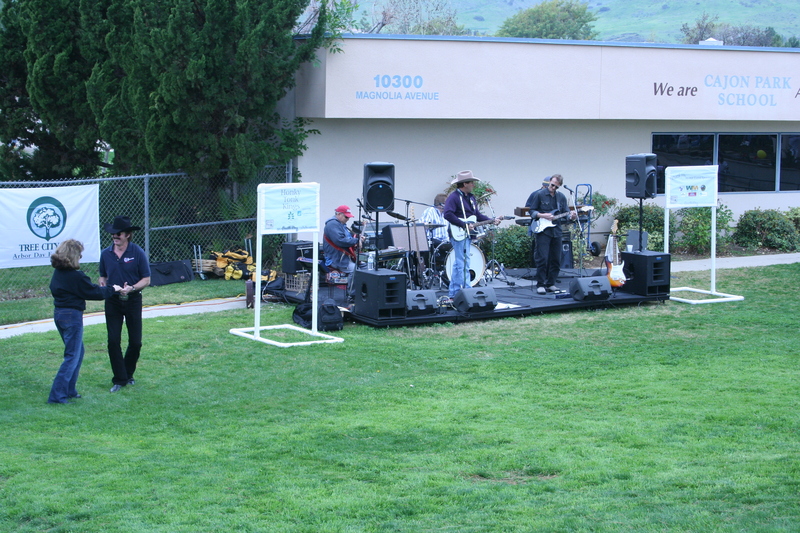 Music for SanTree Fest was provided by the Virtual Strangers, a top local bluegrass band. Santana Cheerleaders passed out avacado cutters. 2009 Miss Santee, Sierra Billock, and Miss Santee Teen, Nicole Ehlke, greeted visitors. West Coast Arborists presented a tree climbing demonstration. You can check out the websites of any of the organizations involved if you want information about getting involved in conservation and community activities. This Saturday, March 14, from 10:00 am to 1:00 pm, Santee will hold its fourth annual SanTree Fest to celebrate Earth Day and the city’s sixth straight year being named a Tree City USA by the National Arbor Day Foundation. 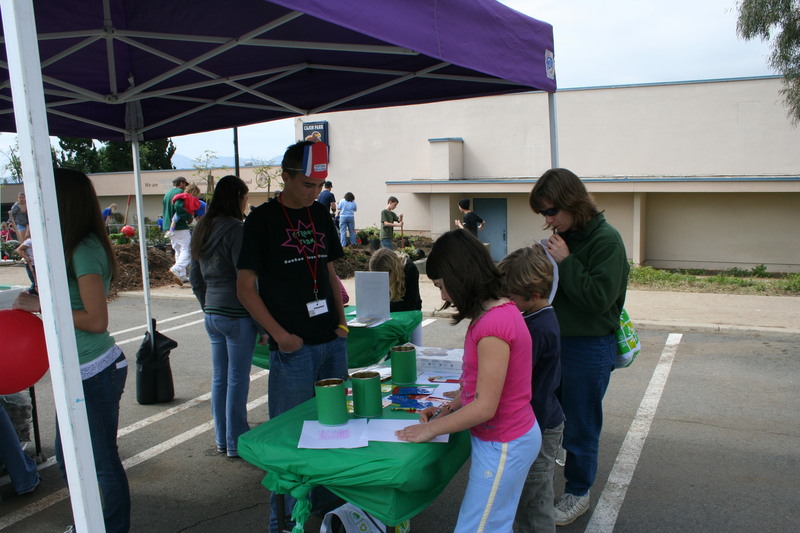 Last year’s event was held at Cajon Park School, and included tree planting, information booths, food, music, and tours of the school’s garden. This year the festival will be held at Mast Park and will also include a guided nature walk starting at 9:45 am at the trail entrance on the northwest side of the Wal-Mart parking lot. The walk is billed as an all-ages and abilities event, and makes a nice kick-off for the rest of the day’s activities. Tree planting will begin about 10:15 am, and you will need a liability waiver to take part in that or any of the cleanup activities planned. There is no need for a waiver, however, if you just want to come out and enjoy the day with your neighbors, check out the booths (several local restaurants will be involved), or listen to the bluegrass music of Virtual Strangers. And best of all, it’s all FREE! (Love that word, don’t you?) By the way, there will be no parking at Mast Park except for handicapped visitors – please park in the northwest Wal-Mart lot or at Carlton Hills School. For more information about the event, check out the SanTree Fest page at the city website (where you can also download the waiver form), or call 619-258-4100 ext 201. Thanks go out to corporate sponsor Waste Management for helping to make this event possible. Yes, you read that right – “Santree” – as in the Arbor Day Foundation’s “Tree City USA” program. Santee is one of the nationally-recognized “Tree Cities” in the country, reflecting the city’s commitment to urban forestry programs. If you haven’t noticed, there are a lot of trees in the community, particularly in the city parks. In fact, the parks are so full of trees (considering the need to balance open and recreation space with trees) that this year the Santree Fest was held at one of the local elementary schools. Cajon Park School, located just a few blocks north of Santana High School and across the street from Woodglen Vista Park, was the site of this years “plant-in.” Several dozen parent volunteers joined with community groups and local businesses to plant trees along the north and east sides of the school and in the newly landscape entry area. Among the local businesses that provided worker and/or supplies were The Hartford and Best Buy. The festivities included music by the Honky Tonk Kings; goodies from Coldstone, Hot Dog on a Stick, Smoothie King, Starbuck’s, and Souplantation; and displays from community groups and businesses. The weather could have been a little sunnier, but the cloud cover did make the work easier than full sun would have. The festival was scheduled to begin at 10:00, but it looked as if much of the planting had gotten started before that. By the time my daughter and I arrived around noon most of the planting on the north fence line was pretty much completed (not that I had planned to help with the planting – I’m a photographer, not an arborist). It was obvious that everyone was having a good time – there was no griping or arguing that I could hear going on from the volunteers, the folks who had just come to watch or enjoy the booths were smiling – it was just an all-around good time. 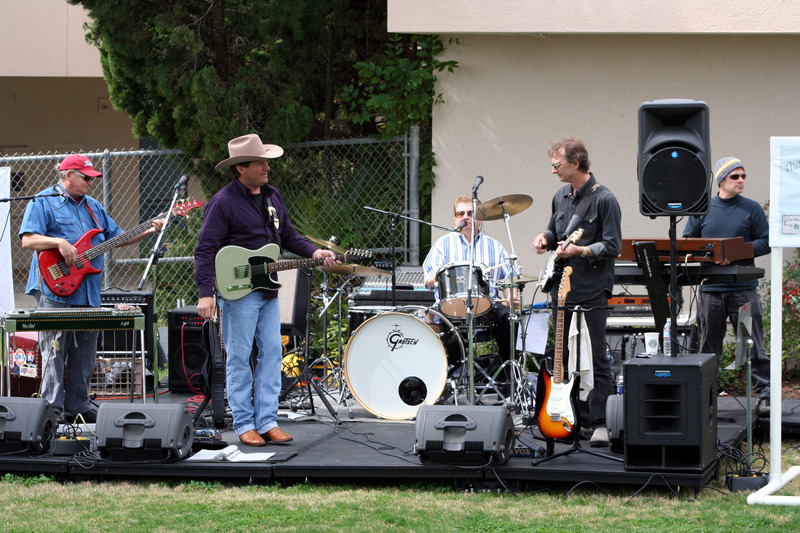 Cajon Park School was a great location for the festival – and not just because it’s my daughter’s school. They have a wonderful program there that gets the kids directly involved with growing things – The Garden. That’s what it’s called, and that’s what it is. On the west side of the upper campus is an area that has been set aside as a garden, with plots for most of the grades 1-6 classrooms. They have a multitude of edibles there, from carrots and radishes to snap peas and broccoli to cabbages and chard. The garden also has an herb area with thyme, oregano, parsley, and nasturtiums (edible flowers that have a peppery taste to them). There is enough to write about that I will devote another blog just to The Garden. Back at the festival, there were quite a few community groups in attendance. The Santee Teen Center had a booth that not only informed people about the center, but also had little craft activities that the teens helped younger children with. CalFire was also there with Smokey Bear and a brush rig, and I had a nice chat with one of the firefighters from the squad. 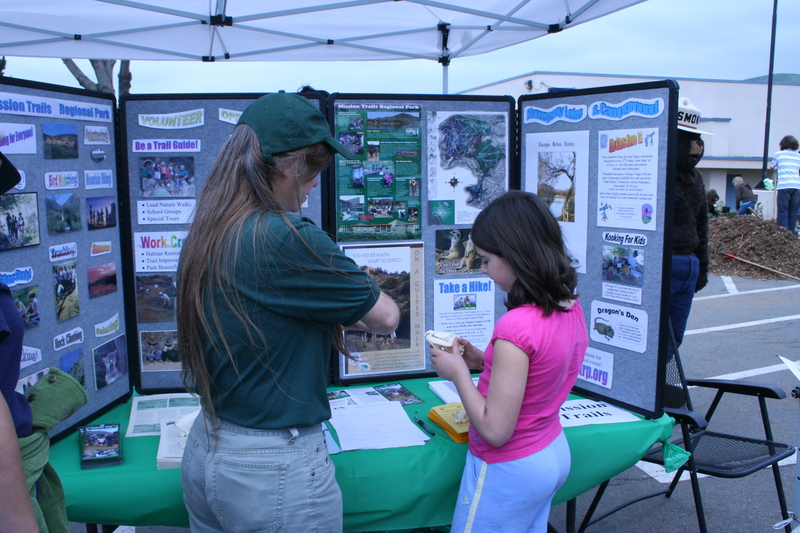 My daughter really enjoyed talking to the volunteers from Mission Trails Park and checking out the skull models they had – a skunk, a raccoon, and a coyote. I’m sure she will be bugging me to get over to the park again soon. The Wildlife Rescue group was also there with a hand-raised crow that someone had been keeping as a pet until it got to be too much to handle. Santee holds the Tree Fest every year, so if you missed this one keep your eyes open in 2009. Maybe they will be planting at a school near you.